Just a few days ago we were wandering around the Acropolis site, now we are settling back into life on our little hobby farm in Bridgetown Western Australia. It’s taking some adjustment – no afternoon siesta today and is it too early for wine? Our caretaker Kim has done an outstanding job of taking care of our property and our nine pet sheep whilst we’ve been away. Despite having no wine, I’m enjoying sitting in the glorious sunshine, admiring the colour that has popped up under Kim’s care. Shaun, Pumpkin and the rest of the gang can’t resist coming over for a nosey and a scratch – being hand reared they are very friendly – and very spoilt! As well as the poppies and other beautiful blooms appearing, so have the wild oats. Ivan is whippersnipping like a man possessed today. The little blue wrens are also crazily busy in this lovely spring weather. I’m thinking Kim may be a bird whisperer as we’ve never seen this many birds in our garden before. Its an absolutely gorgeous day in Bridgetown and perfect weather for the Festival of Country Gardens’ main event being held this weekend. Gardens are open around the region plus wildflower/bird walks, a sundowner garden fair and dinner! It’s a fantastic event and brings garden lovers from all over to our town. The townsite is just a two minute drive or a half an hour leisurely walk from our bed and breakfast – the Green Welly. In the main street we are spoilt for choice for cafes, all serving great food and coffee. They set up tables and chairs on the footpath in the open air so that customers can enjoy the beautiful weather whilst watching the world go by. Many of our shops set up a basket or two of merchandise or a rack of clothing, out the front of their shop, which creates a lovely environment for shopping and walking. Our shops are unique, the quality and variety are second to none. There are also galleries, a museum and so much more all within a short walking distance. You can visit the Ashbil Community Garden, wander through the garden including the recently completed and thriving Bush Tucker garden. Ivan is the compost king and will happily talk all day about compost. Greenbushes – a historic timber and mining town is just a 10 min drive from Bridgetown. The Mine Lookout gives a birds eye view of the Pit. Open daily, the lookout provides an opportunity to view an operational mine site. People are friendly in the country, a stranger will hold the door open for you, people talk to each other, our shop keepers smile at us and have a chat rather than just offer the mandatory “have a nice day”. Bridgetown has a great community spirit which makes it a great place to live and a fantastic place to visit. Whether you are coming to Bridgetown for an event, a romantic getaway, a celebration, whatever the occasion – we’ve got you covered. There are plenty of accommodation choices available in the town and surrounding areas, catering to all needs and budgets. We love what we have created at the Green Welly, offering visitors a unique personalized experience. Our accommodation is both private and comfortable and perfect for that country escape. We source as much local produce as possible from neighbours and friends. Our breakfasts are all home made goodies. I’m making some of our delicious breakfast granola and a loaf of Banana Bread shortly so will post the recipes. Ivan needs to finish that whippersnipping and collect our chooks from their holiday at a nearby property, (the girls are going to be busy!) It’s starting to sound hectic around here. I think I’ll get a quick siesta in while I can and then maybe a cheeky glass of wine on the verandah. 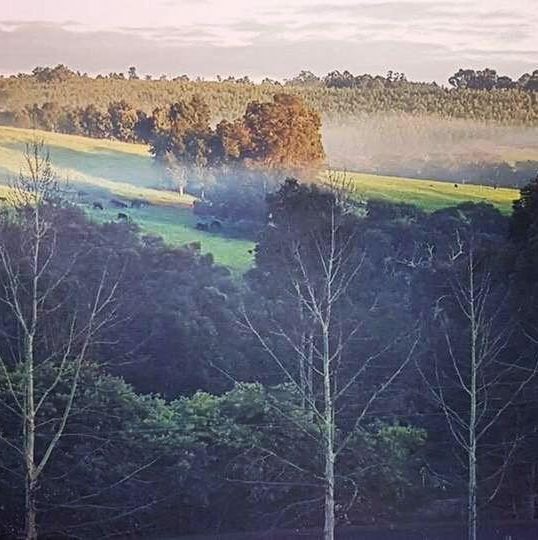 There’s always something going on in Bridgetown so we hope you enjoy following our view from the verandah at our cute little B&B. Ahh home sweet home, and what a warm, beautiful and delicious home The Green Welly is.